Twenty years since Nelson Mandela was released from prison South Africa hosts the 2010 football World Cup. However, despite this historic anniversary, many questions remain. Will the Rainbow Nation host a tournament that is successful on more than just a sporting level? Can football hasten the healing process for millions of South Africans still living in the shadow of apartheid? What does this mean for South Africa and the continent’s developing global image? Dr Danny Jordaan, CEO of the tournament, explores the possible legacies the World Cup can bequeath. 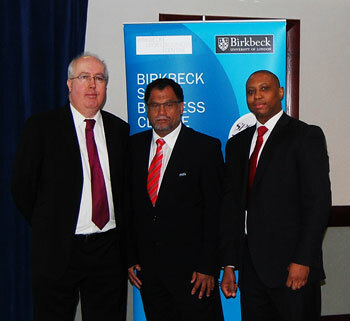 Sean Hamil, Co-Director of the Birkbeck Sport Business Centre, and Themba Ndlwana, alumni of the Birkbeck MSc Sport Management & the Business of Football, with Dr Danny Jordaan. Themba, a native South African, delivered the vote of thanks to Dr Jordaan on behalf of Birkbeck.